← Parkinson, Aklinski, Maton, Russ and Warren Lead the Phillies AA Team to a 2-1 win over the Pirates. In Thursday’s minor league game at the Carpenter Complex, I watched nineteen-year-old Ben Brown pitch two innings against the Blue Jays Low A team and last Friday we watched Ben pitch against Villanova’s college baseball team. The more I watched him, the more he reminds me of the Phillies great Hall of Fame pitcher, the late Jim Bunning. Bunning was the Phillies pitcher that I most remember from my youth. His 1964 Father’s Day Perfect Game, I will never forget. I even patterned my pitching delivery back then with a big follow through just like Bunning, though I was lefty. Brown pitched the third and fourth innings in the game. It was Ben’s big breaking ball that brought back memories to Jim Bunning’s perfect game final strikeout. I had a similar angle watching Brown’s strike three in the third inning of Thursday’s game as the TV camera provided for me in Bunning’s first strike of his strikeout for the final out of his perfect game back in the day. Watch Ben Brown HERE and Bunning HERE. Well, it’s nice to dream but I think Ben Brown is a pitcher to keep an eye on this season. Likely, he will be pitching for Lakewood to start the season. The Phillies Low A ball team won the game, 2-1. So far, I have watched two minor league spring games both won by the Phillies by identical 2-1 scores. In the two games I have watched so far, the Phillies minor league system has a lot of good arms. Now, I need to see some bats come alive! 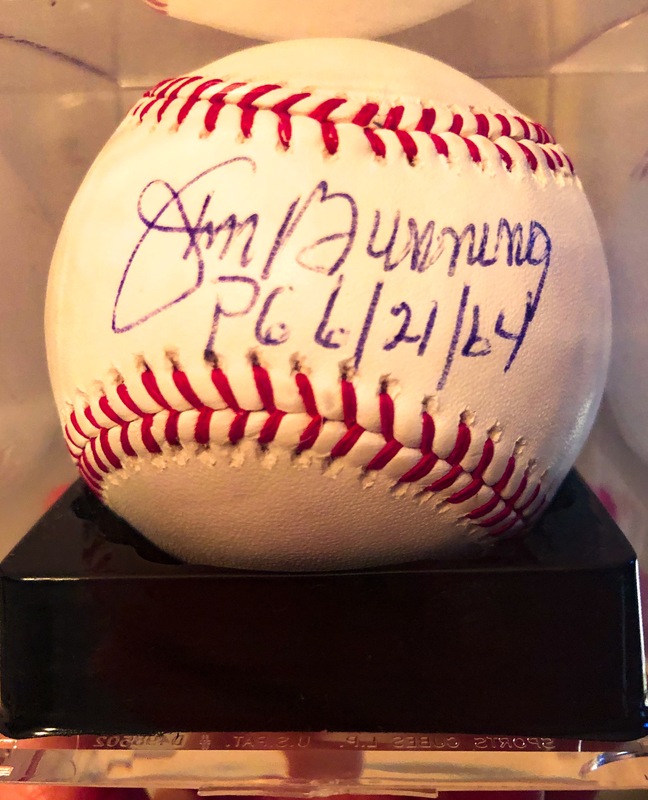 This entry was posted in 2018, 2019, March and tagged Ben Brown, Jim Bunning, Philadelphia Phillies, Phillies minor league spring training. Bookmark the permalink.